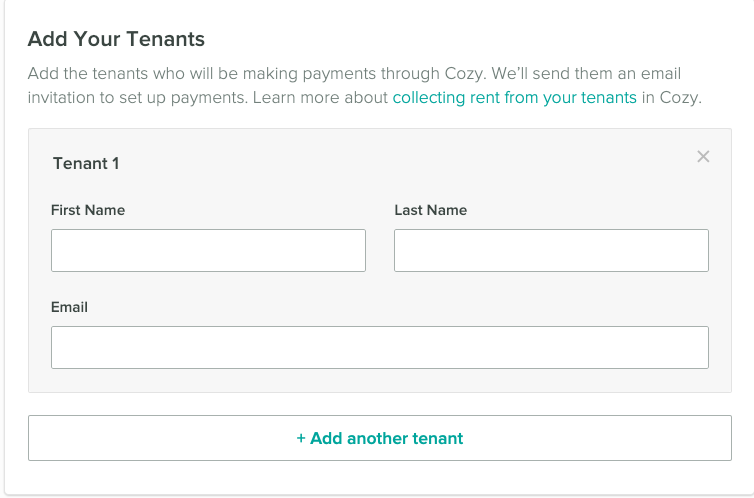 If you're wondering how to get your tenants to start making payments on Cozy, you're in the right place! This guide will show you from start to finish how to set up a rent collection. Tip: This setup shouldn't take more than 5 minutes but keep the rent details handy as any drafts can't be saved. 1. From your Payments tab, click the "Start collecting rent" button. Tip: If you already have an existing rent collection on Cozy but want to set up a new tenant, just simply click on "Set up rent". 2. Set when you want the rent collection to start and when you want it to end. If you want to collect rent on a month-to-month basis, tick the box next to "Month to Month". 3. Next step is to add the tenants who will be making payments through Cozy. 4. Set the monthly rent amount and when rent is due. Cozy will remind your tenant 5 days before rent is due if we notice that any payments haven't been scheduled. Tip: If you have roommates on one unit, you'll want to list the total rent amount due and then each tenant will be responsible for paying their portion of the rent. 5. In this section, you also have the option to set up automatic late fees. You can select from 1-31 days after rent is due, when you'd like the late fee to apply. On Cozy, an automatic one time late fee will apply anytime there's a balance. 8. Add any move-in costs! If you'd like to collect a security deposit or other move-in costs like a Pet Deposit, this is the place to request them. 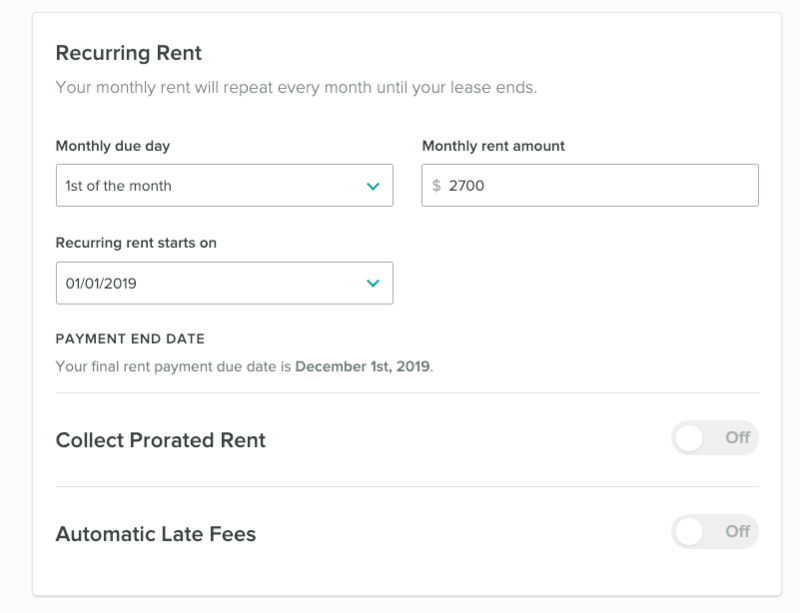 Even if the lease doesn't start until a later date, you can set the due date to whatever date you'd like and your tenant can make a payment before they move in. 9. Now the most important part: this is the place to select where you'd like to receive the rent payments. We can only send payments to one checking account per unit. 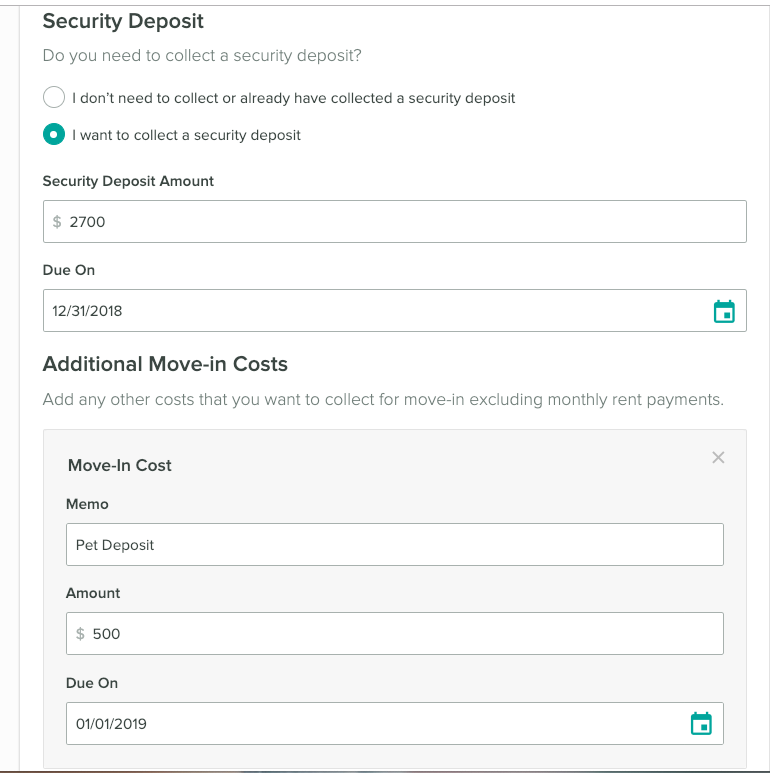 You can select a second account to receive your security deposits. 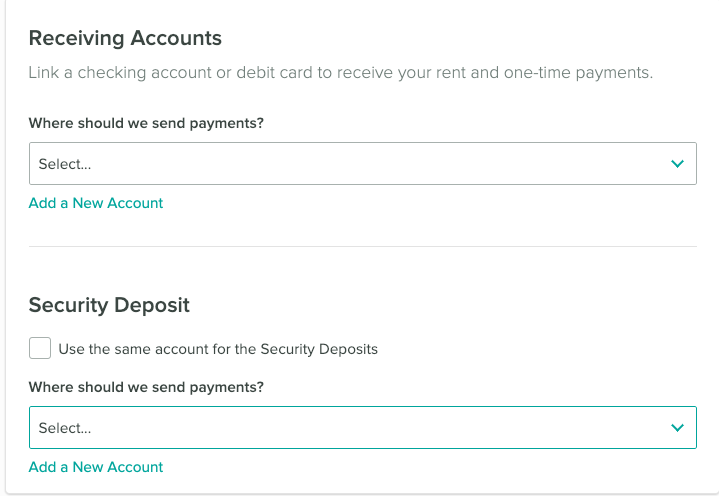 Just let your tenant know that when they first get started on Cozy, they'll only have one chance to send a security deposit payment to this account. Remember, this is a shared section and your tenants will have access to any documents you upload here. 11. Want to protect your property? 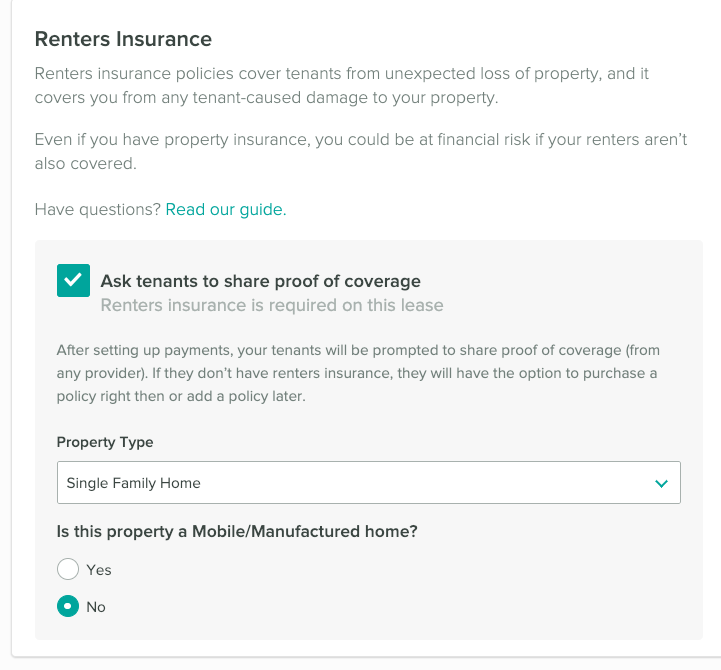 You can request that tenant share proof of their renters insurance. A tenant can instantly receive a quote for renters insurance and purchase it directly on their Cozy account or they can enter their proof of policy details. 12. The last step is to review your information! If everything looks correct, click "Confirm and Invite" and we'll email your invited tenants right away. See the invitation email we send tenants here. Made a mistake? You can always change your rent collection setup by clicking on Rental Details and making the changes you'd like there. Wondering if the tenant accepted your invitation to join Cozy?